One officer, Lt. Col. M, killed, one injured and evacuated to hospital during IDF operation three kilometers deep inside Gaza. An IDF officer from an elite unit was killed on Sunday night during an operation in the Gaza Strip. The IDF later identified the slain officer as Lt. Col. M., keeping all other details of the deceased classified. Another officer was injured and evacuated to the Soroka Hospital in Be'er Sheva. The hospital said on Monday morning that the officer underwent an operation overnight. He is listed in moderate and stable condition. The statement called on residents of the Gaza envelope to listen to the instructions in their communities and obey the instructions issued by the Home Front Command. The incident occurred during an IDF operation three kilometers deep inside the Gaza Strip. The force entered Gaza in a civilian car, apparently in order to eliminate or kidnap Nur Barakeh, commander of the eastern battalion of Hamas’ Izz Al-Din Al-Qassam Brigades in Khan Yunis. 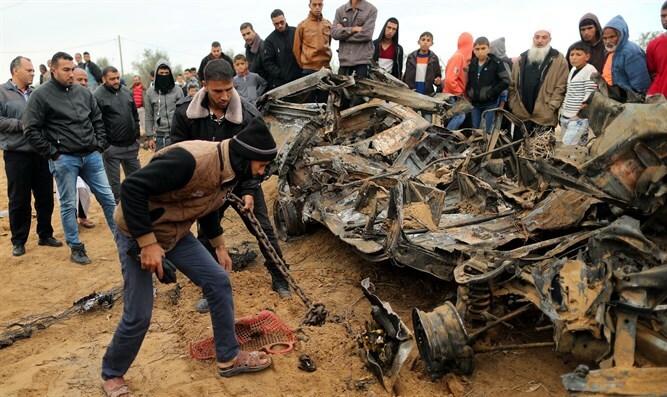 According to reports from Gaza, due to a complication in the operation, exchanges of fire broke out between the terrorists and the Israeli forces, during which the Israel Air Force attacked in Gaza and killed at least seven Hamas terrorists. The special force of the IDF was able to leave Gaza and, contrary to rumors that circulated at the time, no soldier was kidnapped. Following the incident, Prime Minister Binyamin Netanyahu cut short his visit to Paris and is now making his way to Israel. On Sunday evening, sirens were heard in the Gaza envelope. According to the IDF, as of 5:15 a.m., 17 rockets had been fired from the Gaza Strip. Three of them were intercepted by the Iron Dome, and the rest exploded in open areas. There were no physical injuries. Residents living in the area reported hearing loud explosions. Residents of the Eshkol Regional Council were called upon to remain close to protected areas. The Home Front Command announced that schools in the Gaza envelope will be closed on Monday due to the security situation. Meanwhile, the Al-Qassam Brigades issued a special statement following the incident in Gaza. "A special force of the Zionist enemy infiltrated using a civilian car in the area of ​​the Shahid Ismail Abu Shanab mosque, 3 km east of Khan Younis. This force killed the commander of the Al-Qassam Brigades, Nur Barakeh,” said the statement. "The incident continues and our forces continue to respond to this dangerous Zionist aggression," said Hamas’ statement.